Adria Airways Switzerland is facing financial difficulties according to the Swiss Broadcasting Corporation. The airline will lay off twenty of its eighty-strong workforce by the end of October and is evaluating its route network. The carrier's only two scheduled routes from its base in Lugano, to Geneva and Rome, are underperforming but will be maintained until at least the end of the year after which their future will be determined. 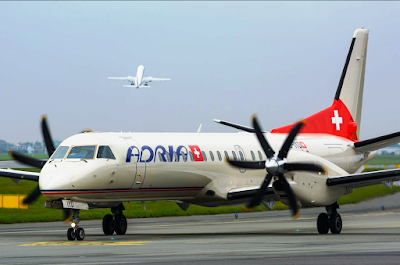 Adria Switzerland has also wet-leased aircraft to its parent company Adria Airways in Slovenia, which has been using a Saab 2000 and ATR72 turboprop on flights from Ljubljana to Podgorica, Prague, Pristina, Sarajevo, Skopje, Tirana and Vienna. Adria Airways purchased a majority stake in the Lugano-based Darwin Airline through its owner 4K Invest this summer. I sad se postavlja pitanja zašto je to uzeto? 1. Da se spriječi prodaja nekom drugom i da se uništi konkurencija Swissu? 2. Da se dođe do turbopropa, pa da se kompanija odvede u stečaj? Jel to moguće izvesti bez posljedica? 3. Da se kompanija ogoli, svede na 3-4 od 10 aviona, ukinu sve linije i da bude ACMI, kako sa Adrijinim CRJ700 i CRJ 900, tako i sa tim turbopropima? Iskreno mislio sam da će Darwin preživjeti kao feeder Swissu (da će se ukinuti Rim, a iz Lugana letjeti do Geneve i Municha) + da će prodati svih 6 neisplative Saabove, a ostati na floti ATR-72, od kojih će jedan do dva otići u Ljubljanu (za letove u regiju), jedan će letjeti na gore navedenim linijama, a jedan će se rentati iz Švicarske + imat će mogućnost rentanja Adrijinih CRJ. No, ovo sad je puno prebrzo. Pa još se nije osušio potpis na ugovoru. I to otvara kamaru pitanja! Apparently, the ATRs are going away, the Saabs are staying. Purger, dobar komentar. Obično se slažem sa vama. Ali ipak, Darwin je prije mjesec dana objavio konkurs za FO. Traže non-TR i TR kopilote za Saabove i ATR. Zašto bi upravo sada, kada počne zimska sezona, tražili nove pilote, ako če se, po vašim pretpostavkama, kompanija smanjiti na 3-4 ATRe. They've said that both companies are completing each other. But I still don't see any of that. Except Adria SLO, who got entra planes. They are completing each others' losses and failed strategies. Seriously, what on Earth was Etihad doing with all these airlines? This catastrophic expansion strategy will be studied for decades in business schools. The worst part is that we've not reached the bottom yet, and that's scary. Airline business is not about the theoretical academic bull but about doing the right thing. Smart people (more than we are) tried in the past (SR, PanAm, TWA, ...) without success. Only an ignorant person can critisize Etihad who was grown up from a cargo container in AUH and it's deffinitely the airline offering one of the best products in the market. You can all hate Hogan for that, but you cannot take his credits for what he created since. The story behind Equity is more comlex than most mainstreamers are able to see, and its more about geopolitical than accounting. Follow their threads in Germany, Italy, Serbia, look their entries in the markets beside aviation?! If someone believes EY equity was about buying and making a profit like 4K tried in LJU and LUG, than simply indicate you should go back playing with your toys and maybe not just observe but also open your eyes. Whats Etihads or Hogans big achievement? Taking billions of USD government aid and build up an airline? If the goverment gives me 20 mio USD, I will build u a state of the art Restaurant in Belgrade and it will be absolut top notch and the in place of BEG. Is that an achievement, not really. Arabs had too big dreams and reality has caught them up again. The earnings from their oil resources have declined significantly and in all Gulf countries, governments are cutting spendings and are trying to find new incomes such as for example airport fees, VAT, Visa for Oman costs now 2.5 x more as before. Oman CEO Gregorowitsch just stepped down 2 dyas ago. Dreams are over. There is huge overcapacity on too many markets and flights can get loads thru too cheap airline tickets only. No need to turn to personal insults by calling people ignorant persons and asking them to go back to playing with their toys. Totally uncalled for. I don't understand why question education and business schools. If they're so useless why would so many people pay so much money to get MBAs and employers pay top money to hire them? As JU520 BEGLAX says, I can come up with absolutely mind blowing products and services if turning a profit is not the objective. In addition, if "Equity" was more complex than us mere mortals can comprehend then please let us know what has it achieved or is it likely to achieve? Am I so ignorant to question branding a tiny airline in a different continent to your hub as "Brand Regional" and then after years of engagement leaving it with 2 air routes none of which is profitable? I am simply observing, but I'm happy to be educated. Over to you. I think that they didn't quite have a clear idea what shoul or could be done for the survival of newly purchased asset. Even worse, they were calmly waiting until someone would eventually come up with the viable solution. That didn't happen, obviously. Adrua itself worries me even nore. I expected Lufthansa to jump in and help or direct it's loyal partner. The same goes for Croatia Airlines. One would expect Lufthansa should care more about its partners that have devoted nuch of their block hours to feeding LH's flights at no risk and no cost fir LH.